In a Dutch oven or stock pot, heat olive oil to medium. Add onion, carrots and celery and cook 7-8 minutes or until soft. Add spinach/kale, garlic, oregano, Italian seasoning, salt and black pepper and sauté 1-2 minutes, until greens are wilted. Add diced tomatoes with juice, beans, pasta, stock and Parmesan rind to the pot and bring to a slow simmer. Cook 8-10 minutes or until pasta is almost al dente. Stir in zucchini and cook 2-3 more minutes. 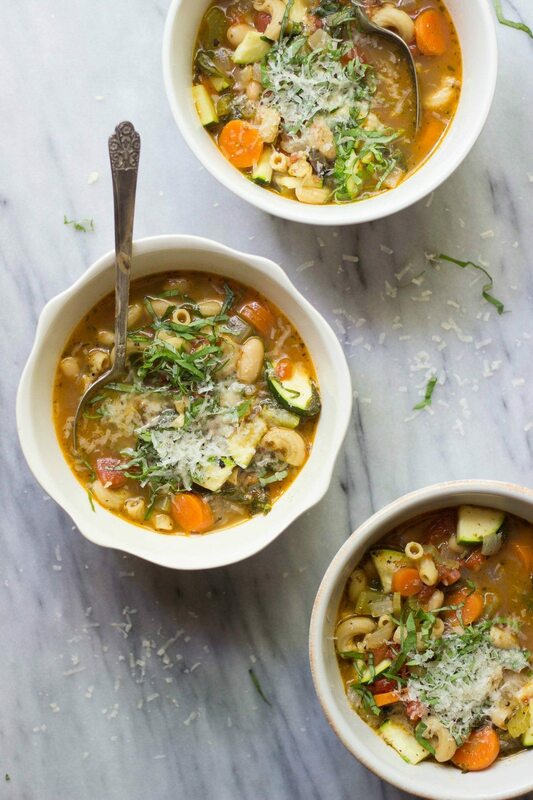 Scoop minestrone into bowls and top with fresh basil and freshly grated Parmesan cheese. Discard the Parmesan rind or save for another use.